A couple of weeks ago I injured the index finger on my left hand. That’s a problem for several reasons. 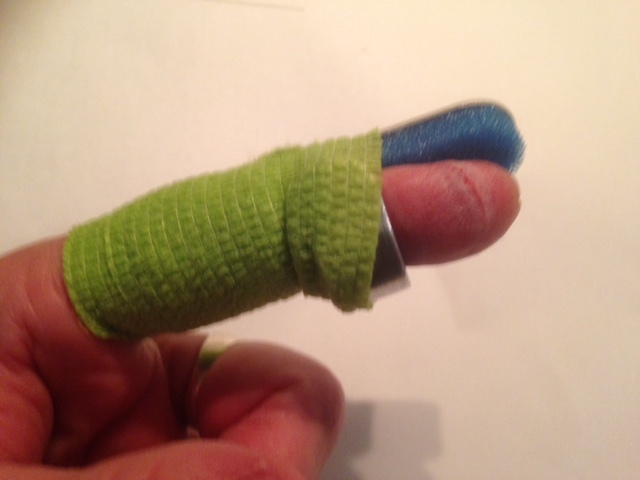 First, it’s hard to type with a splint on a finger. Secondly, I’m left-handed. Thirdly, I play guitar right-handed. My concerned (nosey) friends wanted to know what happened. I told them that I’d cut my finger on a Diet Coke can. I lied. Here’s what really took place. I had the honor of playing in a dear friend’s memorial concert at Duling Hall in Jackson. Since I typically play for an audience of three—me, myself, and I—I was as nervous as Little Bo Peep in a snake pit to be in front of a full house of amazing musicians. But I agreed. That’s what friends are for. They placed me in the line-up right after Mark Knopfler. It was a special segment called “Intermission.” The lights were so bright I couldn’t see the audience, but I knew that the show must go on, so I started playing a few of my melancholy ballads. That’s my expertise. The house was so quiet you could hear a proverbial pin drop. I knew my songs were good, but I had no idea that I’d have the crowd so enthralled. When I finished, they were so blown away they couldn’t even applaud. Next up was the entire cast of the show for a 45-minute jam session. As I was walking off-stage Eric Clapton and Eddie Van Halen blocked my exit. Elton John jumped up on top of his piano and screamed: “GET BACK, HONKY CAT”. McCartney joined the chorus: “GET BACK JOJO!” I returned to center stage. What else was I to do? Paul McCartney lambasted the audience for not giving me the respect I deserved, then Cat Stevens led a brief meditation for the people to refocus their spirits toward kindness. I was appreciative, but embarrassed, and started to leave the stage again. Clapton stopped me and put a blue pill in my hand. He said, “Here, Weeks. Take this. It’s from the ashes of Robert Johnson and Jimi Hendrix. So I took it. Washed it down with some Old Crow that Carlos Santana handed me. The music kicked in and so did the Johnson-Jimi. Before long I was playing licks I’d never even dreamed of. Eddie Van Halen took my Taylor acoustic and handed me a Fender Stratocaster. I’d never played electric before. Dylan started in on “All Along the Watchtower” then nodded to me for a guitar solo. My fingers weren’t my own. They blazed up and down the neck of the guitar in a blur. Over and over and over again I drove it home until the high E string sliced into my left index finger. Blood was pouring out but I was on a roll. I could feel that Johnson-Jimi mojo. The last thing I remember was being on my knees, my guitar on fire, playing like a banshee. They tell me that I finally collapsed due to the loss of blood, but the standing ovation went on until well after the paramedics hauled me away. I woke up in a hospital bed in the middle of a direct, multiple blood transfusion from Clapton, McCartney, Dylan, Knopfler, and the rest. They said, “You killed it man, but you almost killed yourself. We’ll never give you Johnson-Jimi’s again. You just have too much hidden talent. But we are gonna to give you a piece of us to take with you. When the transfusion was completed my new friends said, “Tonight was awesome, dude! Awesome!” Then they all squeezed my shoulder in brotherhood and left—except for Dylan. He pulled a chair close to my bedside and handed me his guitar. “Teach me uh how ta un huh un huh un huh one of those ba-hallads, Weeks.” So I uh huh did. My finger has healed and my mediocre guitar playing has returned. But I’ll never forget the night I rocked Duling Hall with the best of ‘em. Their blood runs through my veins and I know that they’ll always have my back. So that’s the story of how my left index finger was injured. Believe it or not. Truth, as they say, is stranger than fiction.